Vision Zero is the goal of eliminating all road fatalities and serious injuries. Town Meeting members: The Milton Bicycle Advisory Committee urges you to vote in favor of Article 15, which would allow the town to reduce the speed limit to 25 miles per hour on residential roads. 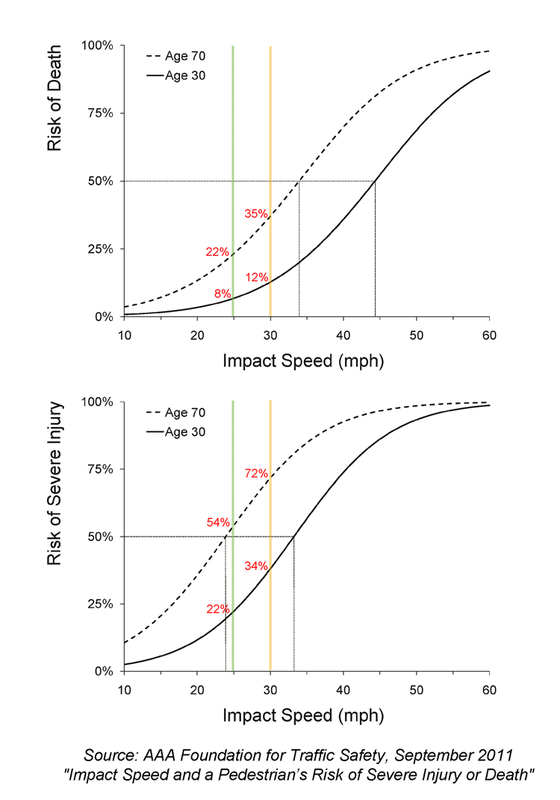 While a 5 mph reduction may not sound like much of a change, it dramatically increases the chances of survival for vulnerable road users like pedestrians and bicyclists, and the results are even more pronounced for seniors (see the chart below). It also would help improve safety for motorists, although to a lesser degree. This article would not address speeds on Milton's state roads, but combined with the new radar speed signs the town is buying, this will help to improve safety on Milton's side streets. Thank you for your support!